The Productivity Slowdown: Mismeasurement or misallocation…or both? While I was just as happy as the next wonk to see the strong jobs report last week, it did trigger a nagging thought: productivity growth must be really slow. Now, we know that growth hasn’t been that strong of late, and we know that job growth has been pretty solid. Together, they imply slow productivity growth, and that’s the arithmetic I thought about on jobs day. The figure below shows annual productivity growth since the 1940s, along with a smooth trend, which is the better way to look at this series (since it’s pretty jumpy). 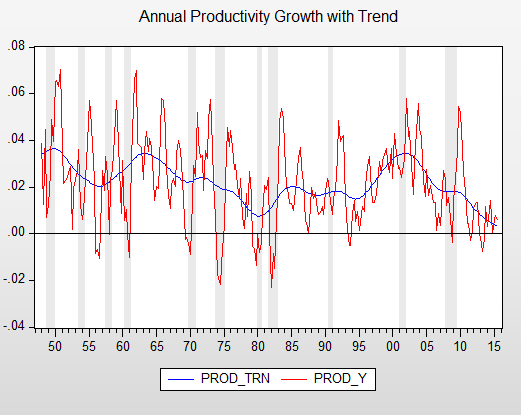 Since 2010, trend productivity growth has been running at around 1 percent. That’s pretty lame. From 1995-2005, it clocked in at a healthy 2.7 percent. The question is, then, how do we regain our productivity mojo? Don’t worry. It’s just mismeasurement. One school of thought maintains that we haven’t really lost it (i.e., our productivity mojo). We’re just failing to accurately measure the value of lots of cool tech stuff, meaning we’re generating more output than the records show, and thus more output per hour. I suspect there’s something to this, but it’s actually a very tricky point. First, you can’t just show mismeasurement. Since we’re talking growth rates, you have to show increasing mismeasurement. Second, you have to figure out how such mismeasurement gets counted and how much it’s worth. That’s as much art as science. Moreover, at least as I read the evidence, all of this speculation doesn’t alter the fundamental picture of a productivity slowdown. 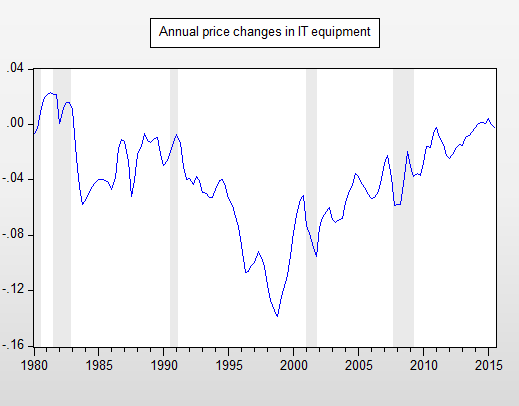 One reason some analysts think we’re increasingly underestimating output is because computer prices in the national accounting system have, in recent years, stopped falling as quickly as they used to. Let me explain. Suppose you bought a decent laptop in 1995 for $1,500. Now, supposed you go back to the store five years later and buy a new computer for the same price. Inflation should be zero, right? Wrong! That new machine does a ton of stuff the old one couldn’t—it’s faster, lighter, has more storage, a better screen, etc. Let’s say it’s 20 percent better, meaning you got a 20 percent break on the price. In a truly quality-adjusted, no inflation world, it would have cost $1,800. But it costs $1,500. So, the price actually fell. The figure below shows that such price declines were annual events back in the day. But in recent years, the computer deflator hasn’t fallen much at all. Have you noticed computers getting better at a slower rate? A number of economists have concluded the problem is we’re not recording the quality-adjusted price declines the way we should be. Thus, there’s more output and faster productivity growth. Relevantly, as you’ll see, some of that has to do with increased import penetration of computers and the fact that our price system appears not to be effectively capturing quality improvement in imported as opposed to domestically sourced IT equipment. On the other hand, my intuition is that computers got a lot better—faster, with better web access—up until maybe a decade ago, and since then, their pace of improvement has slowed. It is possible that the trend above in IT prices is directionally correct. Goldman Sachs economists dove into this question (no link available) and came to a different conclusion, arguing that a good chunk of the decline in productivity growth is a result of this pricing problem, along with missing all the benefits of free apps, websites, wifi, Google searches, and so on. For example, they report that Google’s chief economist estimates that the time saved by free searches may be worth $150 billion a year, or almost 1 percent of GDP (a bit like asking your barber to value your haircut, that). Jeez, I dunno. They must be right about the direction. A lot of this stuff adds way more value then we pay for it (especially when it’s free!). But assigning magnitudes has got be largely hand wavy, and deciding that those magnitudes have grown—remember, they’ve got to prove not just mismeasurement, but increased mismeasurement—tends to invoke another layer of speculation. It must also be the case that some technology makes life worse, i.e., that deteriorating quality adjustments would raise the prices of phone menus, robocalls, air travel. Are the national accounts accurately reflecting the efforts, costs, and downtime lost to fighting against computer viruses? Weirdly, economists virtually never consider that side of the equation. Some hand-waving is inevitable here but I worry about unidirectional hand-waving. Economist Sue Houseman has also shown a way in which increased imports are leading to an upward bias in our productivity measures. Increased outsourcing of goods and labor lowers the cost, and thus increases the quantity, of intermediate goods in manufacturing, but again, due to anomalies in our accounting systems, we don’t pick up this cost decline. So we’re undercounting what goes into producing goods and thus overestimating output. Again, tricky, I know. But the point is there’s a tendency to just look around for stuff that biases output and productivity down, when some biases go the other way. As the dollar has gained considerable strength in recent months, imports are likely to accelerate, intensifying this bias. All told, I believe the mismeasurement story but doubt it is of a large enough magnitude to change the fundamental productivity slowdown story. In a bit of my own hand waving, I suspect trend productivity growth is closer to 1.5 percent per year than to 1 percent. That’s still a problem. Do worry. It’s misallocation of productive capital. In fact, after accounting for measurement issues, our productivity problem may be less a slowdown than a misallocation. If you want to see what deeply damaging misallocation looks like, and be entertained by it (really! ), go see The Big Short. Surely the (d)evolution of finance and its contribution to some pretty awful economic outcomes in recent years is diverting investment into non-productive sectors and activities. By devoting an increasingly significant share of GDP to non-productive finance, we become…um…less productive. Note that I am not suggesting that the level of investment is too low, though investment as a share of GDP is not quite yet back to pre-recession levels. This is an argument about its composition. This research emphasizes international capital flows, but especially in under-regulated financial markets, it’s not obvious to me that cheap capital needs to flow from abroad. Once inept (and wrongly incented) credit-rating agencies label dangerous junk as triple-A-grade securities, domestic investment—e.g., large pension funds—can slosh into unproductive sectors as well. I find this research compelling. The conventional assumption is that flows that boost “I” (investment in the GDP equation) are always and everywhere pro-growth. This approach to analyzing the more nuanced impact and even the content of capital flows (investments in some assets are more benign than others) may help to develop a more realistic understanding of what’s driving productivity growth down in nations across the globe. But wait. Didn’t the under-regulated-finance-inflated housing bubble implosion occur years ago? Yep. But such misallocation, I’m guessing (to be clear: a lot of this is new, unproven thinking), takes years to shake out, especially when it involves leverage, shadow banks, bailouts, and all the rest. “Extend and pretend”—where banks convince themselves that non-performing loans would soon come back to life—draws out the rebalancing cycle a lot more than “mark-to-market,” like when the value of your equities in pet rocks falls to zero from Monday to Wednesday. Much more to be said here. This theory invokes the need for more careful oversight of the financial sector and capital flows. It once again reminds us that Panglossian assumptions of optimal capital allocation magically guided by the invisible hand are bunk. In this case, the invisible hand may be all thumbs. It invokes the need for the public sector to invest what’s needed in productive public goods, as misallocation/financialization steers resources away such critical investments. I’ll write more soon on these implications. But for now, the key idea is to give the mismeasurement evidence its due, without overdoing it. More important, I think, is to focus on the negative productivity effects of misallocated capital and what can be done about it. Share the post "The Productivity Slowdown: Mismeasurement or misallocation…or both?" 16 comments in reply to "The Productivity Slowdown: Mismeasurement or misallocation…or both?" Investment isn’t the same as research and development. Investment uses previous research and development. Isn’t R&D the important measure in ascertaining a very intuitive and easily explained reason for lower productivity? But, but, just to have an argument with myself, in a service economy, GDP is very easily overestimated because it’s more difficult to compare the value of services and allocate portions to inflation vs higher productivity. How does one determine whether consulting services at $300/hour vs $200/hour are from higher value vs ability to charge more and thus inflationary? This is much easier with cars. Man hours for car in 1950, man hours for car in 2015? There is a complication in amortization of capital and labor of the factory (labor from machine shop, assembly line construction, down to mining of metals for those materials), but the consulting services have a much more nebulous criteria for establishing value. This is especially true where services are deemed not to be competitively priced, which I would argue is true. Another cause of inflated GDP is bidding. Inequality creates premium prices for goods where once again inflation vs value is uncertain. Artwork would be an extreme example. Monopolistic pricing also inflates GDP without actually adding value, but doesn’t show up as inflation. The price of new drugs, what is inflationary (price gouging) and what is value? If these effects are real and predominate, then stagnation or decline in productivity gain is much worse than measurements. Then again, who cares about productivity if your time is more valuable than it’s use working to be able buy more possessions, the latest I-phone, a new car so you can commute to work, which takes longer due to traffic, and suburban sprawl. Consultancy services are generally an intermediate good. much shorter life span than traditional capital equipment. major if not the dominant factor behind weak productivity growth. I can send you an excel work sheet with the data if you are interested. Imagine if all of that money misallocated to the housing bubble had been invested in anything more productive and sustainable: “human” capital, clean energy, health care, tech research etc. Maybe growth would have been slower and returns on capital less – depending on the Fed’s reaction function – but growth would have been more sustainable. And there wouldn’t have been such hysteresis after all of that job loss. What a waste. Yes markets go up and down but still. The ratio has gone up a bit since the above post but not very much so. For example, they report that Google’s chief economist estimates that the time saved by free searches may be worth $150 billion a year, or almost 1 percent of GDP (a bit like asking your barber to value your haircut, that). Another example, which doesn’t have the “barber” effect, is Craigslist. We have at least a partial value of Craigslist’s value from the revenue losses to newspapers. Since CL is running at cost and the numbers are readily available, some enterprising grad student could get a pretty good value for the amount removed from GDP by converting a nation’s worth of profit centers to nonprofit. Which certainly sounds like a “reduction in productivity” to me, but I’m not an economist. Here is a naive question: are compliance activities productive? There has been an enormous increase in compliance activities in healthcare and in education and probably in banking as well. I can’t see where those activities add to growth but producing documents and reports that nobody reads is labor intensive. Instead there is essentially a compliance industry with compliance products that add to GDP. One sees this in healthcare, education, and banking. The consulting industry feeds off it, and in the age of computers, it’s not all that labor intensive, though the product is mostly services rendered, billable hours for labor. Those compliance activities don’t come cheap, and so they would add to productivity as it’s now measured. It doesn’t mean quality of life improves in a commensurate fashion. Neither does it mean that compliance needs to be reliant on high priced labor. But currently that is how the system is set up. Sorry I don’t have sources and data to back this up at the moment. I’d have to spend time googling, and believe it or not, there’s actually more productive use of my time for now doing something else. …“sustained current-account deficits driven by cheap access to foreign capital can produce a shift of productive resources toward non-tradable sectors such as construction … ” and following. So, what can you say about Australia, then ? This is being over-thought. And you have it backwards. Productivity does not raise living standards, but rising wages force productivity upwards. At the base of Niagara falls, water is very cheap, and nobody cares about conserving it. In the middle of the Gobi desert, water is very expensive, and great effort is made in conserving it. The notion that conserving water makes it valuable is absurd – if you use water more efficiently at the base of Niagara falls – and you won’t, because there is no point – that won’t raise the price of water there. So when labor is tight, and employers compete amongst a limited number of employees, this first drives wages up. It then forces employers to work to raise productivity – and if the labor market remains tight, a lot of the benefits of increased productivity goes to workers. But if the labor market is flooded, wages will fall (it’s called supply and demand, duh) and the incentive to increase productivity will decline. If productivity increases are moderating, it’s because the third-world population explosion and open borders are vastly increasing the available supply of labor, and decreasing the need to make efficient use of it. But we can’t talk about this because it is so obviously true, because the rich find the easy profits that come from ever cheaper labor to be so addictive. Hence the puzzlement over what should be totally obvious. Are you saying the policy regime since Volcker and Reagan of keeping unemployment high enough to prevent wage growth (what they call “wage inflation”) is negligible in this? Combined with other government policies (e.g., enforcement decisions) to reduce labor bargaining power and reduce union membership? Afghanistan, Irag, etc. Are these expenditures along with ever increasing CYA expenses for lawsuit prevention, government regulation, more and more Political Correctness, enough to account for trend?